The conclusion of “The Long Payback,” or, as I prefer to call it, “The Long Pay-off,” because Jurgens & Co. have been teasing the whole Matt McGinness-becomes-Robin–Beyond for several issues. In fact, they’ve been teasing it so much, it became tiresome. But of course, Terry would never permit his kid brother becoming his new Robin, so it takes Bruce, in a moment of desperation, to send Matt off to rescue Terry from Payback. After all, Bruce has put children in harm’s way it no less than four times before. But with Payback dead set on revenge against Terry, could Matt simply become another weapon to be used against Terry. I’ve enjoyed Jurgens’ writing for many years. I believe he has a firm grasp of the fan’s perspective on these characters. 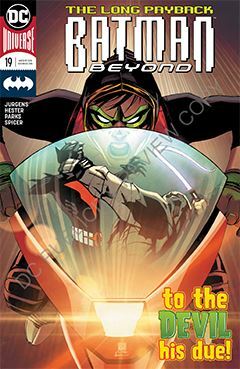 In the case of Batman Beyond, it’s an open franchise, not beholden to the continuity issues of most of the DC Universe. That opens the door wide to so much story potential, and I’m eager to see what a creator of Jurgens’ caliber can deliver. It also helps that Phil Hester and Ande Parks are handling the art. They are a stellar team whom I have missed form the comic book landscape in recent years. I hope they stick around for a good long time.